Lavender is well-known for its wonderful fragrance. A native of the Mediterranean, the perennial herb loves warm, well-drained soil and full sun. It's easy to grow in many climates. The foliage of the shrub is as fragrant as the flower. Grow the herb near your front door or on a favorite patio so you can enjoy the fragrance each time you pass. Rub the leaves between your fingers to release its subtle scent. You can purchase lavender plants or start them indoors from seed. When starting plants from seed, be aware that they will take a while-14 to 28 days-to germinate. 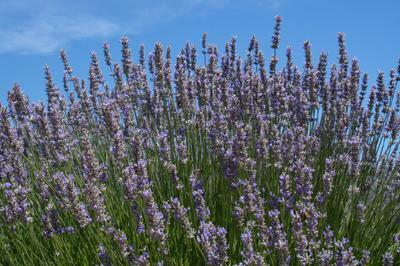 Plant lavender in full sun and well-drained soil. Once planted, it requires little care and is quite drought tolerant. If you add a generous amount of compost to your soil, you shouldn't need to fertilize at all. Cut plants back in early spring and again in early fall to keep them from becoming woody. Lavender is more difficult to grow in northern or extremely hot and humid southern regions of the country. In cold climates, select one of the hardier varieties such as 'Munstead' or 'Hidcote'. You may lose a plant after a severe winter or particularly humid summer. But you can always grow lavender as an annual or in pots. Because lavender is drought-tolerant, it is an excellent choice for containers on a hot, sunny patio. Plants grown in pots can then easily be brought indoors for the winter. There are many different types available. The blooms range from lavender-grey to vibrant royal purple. There are also species with blooms in white, pink, and yellow-green. The flowers of some are small and bud-like, others, open and full. Foliage ranges from dusty green to silvery gray; a few species have bright chartreuse leaves. Lavender comes in sizes to fit almost any garden. Some grow to only six inches high. Others can become four-foot-high bushes in the right climate. L. angustifolia, English lavenders, are early blooming and great for drying. They have narrow, grey-green leaves. There are over 40 named varieties. 'Munstead' and 'Hidcote' are the hardiest lavenders, sometimes surviving in zones 4 and 5 with mulching. 'Lavender Lady' is another popular variety. L. dentata, also called French, has toothed leaves. It is a tender perennial, hardy only in zones 8 -10. It is a good choice for making topiaries and one of the better types for growing indoors. L. stoechas, or Spanish lavender, is known for the wings on its blooms. It is hardy in zones 7-10. These plants flower continuously if you deadhead them diligently. They are beautiful in pots or flower beds but not good for drying. Lavandula x intermedia 'Provence', is cultivated in France for the perfume and essential oil trade. It likes excellent drainage and air circulation. 'Provence' overwinters in zones 8-10. Lavender's relaxing properties make it ideal for making soothing herbal teas, sachets, and eye pillows. Harvest the flowers just as they open, and hang them to dry in a dark room with plenty of ventilation. You can use fresh or dried lavender flowers to make a delicious and calming herbal tea. Use two teaspoons of fresh herbs or 1 teaspoon of dried herbs per cup of tea. Steep the herbs in hot water for at least five minutes. To enhance the lavender flavor, add a bit of honey or stevia herb. Lavender flowers have been used medicinally for centuries. The herb is known for its antiseptic, anti-bacterial, anti-fungal, anti-inflammatory, and anti-depressant properties. The essential oil is popular for its many practical uses such as treating headaches, stress, insomnia, and skin irritation. The herb is also used as a sachet to scent linens and repel moths. Lavender not only smells lovely, it tastes great, too. Flowers are edible and have a sweet and spicy flavor. Try them in vinegars or jams. They taste great in lemonade or with ice cream. Use them to decorate fruit plates, salads, and desserts.